This is one in a series of photos taken at the night market in Luang Prabang, Laos. The Market is super cool, with fantastic shopping and a ton of places to eat. This is a picture of some of the fish that were for sale, there’s a nearby river, and i’m pretty sure the fish come from there, so it’s really fresh. The market is a nice, mellow place to hang out. Don’t get me wrong, it’s definitely a bit on the bustling side, but the attitude is pretty calm, and all of the vendors are friendly. Theres a ton of really cool hand made stuff to buy, as well as some antiques, and pretty much any sort of not-cheesy souvenir you’d want to buy (this includes a pretty impressive array of teeshirts). The food that we had while we were there was really good too, and since it’s market food you can eat it on the go, or sit at one of the tables set up in the food alley if you’d rather relax and eat. If you’re a skeptic when it comes to street food there are also plenty of good restaurants around in town. This picture was taken on Khao san Road in Bangkok, Thailand. Khao San is a pretty well known tourist hot-spot, and is especially popular with younger travelers. There’s lots of great shopping to be done in this area, everything from cheap little sun dresses and printed tee shirts, to necklaces made from snake vertebrae, to more traditional Thai souvenirs. Khao San is also a great place to eat. The street is lined with restaurants and food carts, offering a pretty good array of prices. 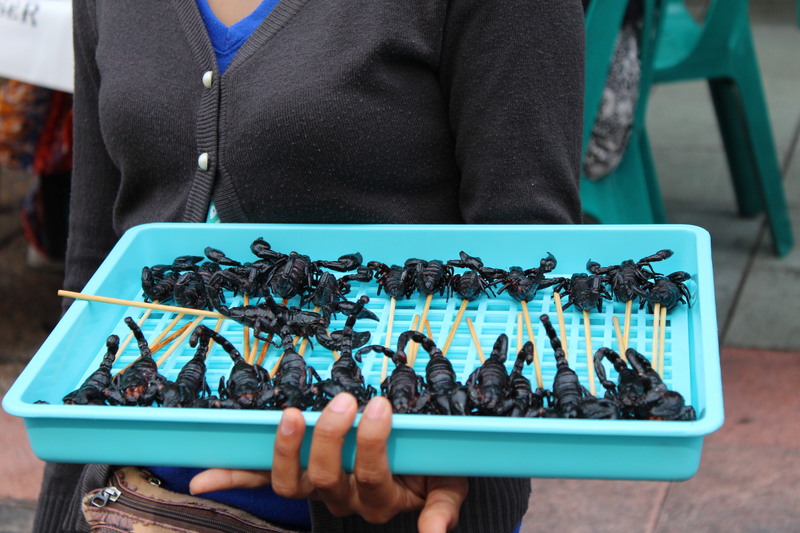 Then there were these, Scorpions on a stick, not your average snack-time food. Unfortunately I didn’t try them ( I had just gotten over being pretty sick, and didn’t really want to risk it), but I intend to try them when I go back to Thailand! We talked briefly to the man that was selling them, and he said that they were good, but other than that I don’t have much information about them. 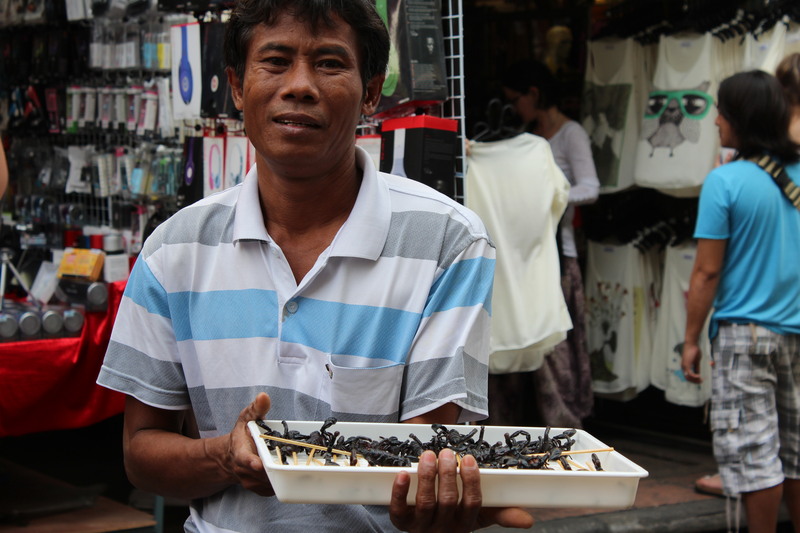 It was, however, an interesting experience to see them selling these scorpions to some of the more daring tourists. If you’re up for it, why not try it, right? 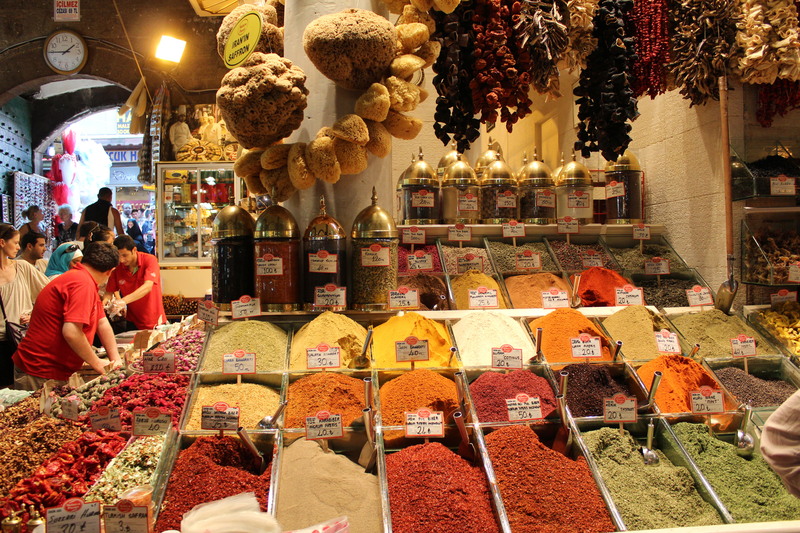 Another picture of the spices for sale at the Grand Bazaar in Istanbul, Turkey. Again, the Bazaar is a great place to shop for tourists, but it’s not super touristy. The vendors are friendly, and it’s a great environment to walk around in. If you want more information look at the other post about spices.